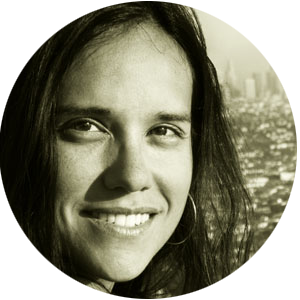 Written by Global Healing Program Manager for Honduras, Latin America and Vietnam, Sarah Fernández, PhD. People thrive by the goodness of others. 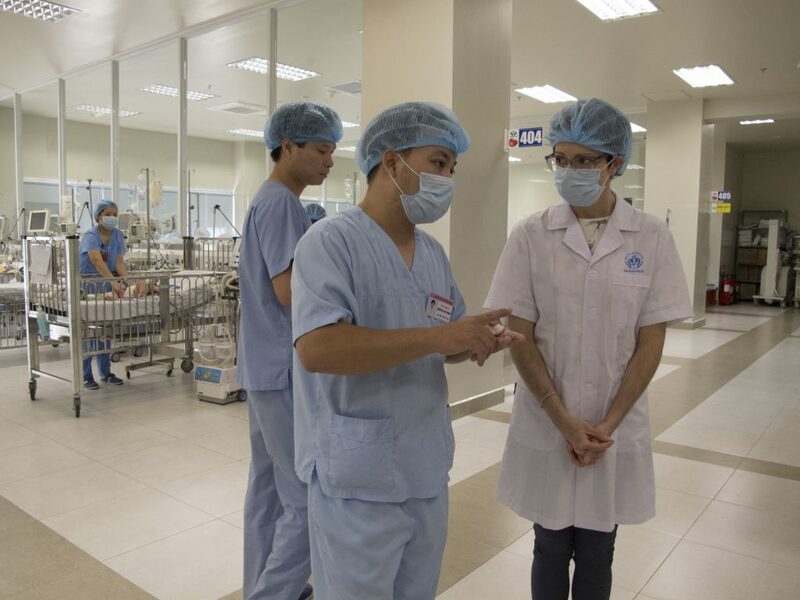 During my time in Vietnam, I am always struck by the openness, trust and dedication that make caring for the vulnerable children and newborns in the intensive care units (ICUs) possible. I want to share a success story with you and feel like simply describing a checklist and procedures won’t quite get to the heart of the matter. 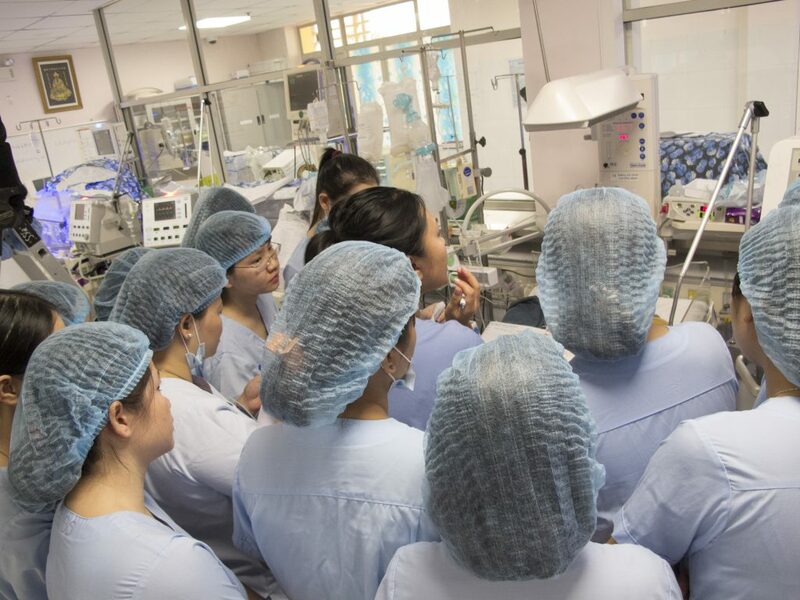 We work with ICU physicians and nurses at the Vietnam National Children’s Hospital (VNCH). During our lunch breaks there is excited conversation and a sense of community that carries over into the daily work of these dedicated individuals. The children and newborn babies in the intensive care units where they work are among the sickest in the country. If a family is wealthy enough, they are able to pay for emergency care at the VNCH right away. More often than not, however, these sick children are also poor and have been slowly referred through a national system in order to receive the care they need. They arrive at the VNCH in critical condition and with little hope. Mothers apprehensively send their newborn babies and small children off with the nurses, placing hope for their child’s survival in the hands of the dedicated hospital staff. When you enter the ICUs, there is a loud hum from the ventilators that keep the children alive. Breathing tubes fill their airways with oxygen and IV lines drape across the beds. Some of the patients are impossibly small, swallowed up by the size of their beds. On one of our training trips, we identified a need for training in the management of bed sores. Lying there, immobilized, these children were suffering unnecessarily, developing skin ulcers as a result of their hospitalization. We knew that a change was necessary – and possible. The mood shifts as we return from the cafeteria to the ICU for the latest round of training. I’m coordinating sessions run by two Global Healing volunteers. One is Whitney Elton, an RN, who is used to working with a single newborn in the ICU back in the states. Here, the nurses she trains have at least 5 critically-ill patients at a time, demanding around-the-clock attention. The time she spends here would have been her vacation, but she has decided to use her time off to provide continued training with Global Healing. Everyone here is making sacrifices to provide for the health of these children. Many of the nurse trainees have worked tirelessly and for decades at the hospital. Yet, they come to our sessions, eager to learn best practices from our volunteers. Still, we’re apprehensive about implementing a new checklist for care. We are asking them to re-approach a problem, to take new steps in a job they have been doing for many years. 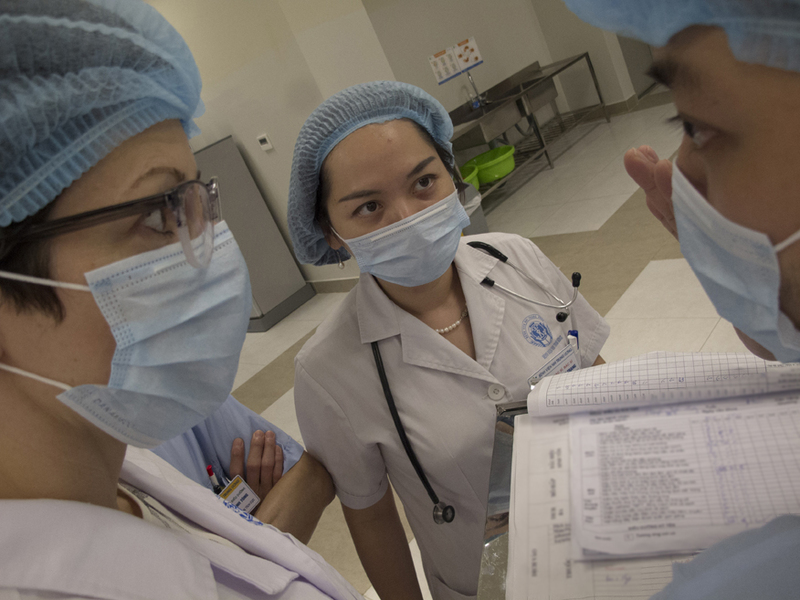 Nurse Hoàn approaches Whitney and a Pediatric ICU physician, carrying a clipboard beneath his arm. Attached is the checklist we have developed for the physicians and nurses to use for each child and newborn. It includes sections to identify whether a patient’s position has been shifted. Instead of leaving those tiny bodies in their big beds, they need to be moved every two hours to prevent bedsores from forming. The sheets that he carries have all been completed for one of his patients, indicating that, yes, the patient’s position has been changed. It’s a small shift. Perhaps many of us take for granted that if our children, or our loved ones’ children, were ever in the hospital, they would have the all the care they needed. Here in the U.S., we face our own healthcare challenges. As I think about what’s in store for the future, I also think about the children in the ICUs in Vietnam. They, too, face an uncertain future, struggling to survive. In spite of the many unknowns, I am able to take solace in the small change that I have just witnessed. The generosity and determination of our volunteers to share the knowledge they have with others. The dedication and openness to change that I see in the trainees who participate in our program. Support from individuals around the world, who have donated to make this program possible. The hope of families that their children will lead healthy, full lives – and thrive. Together, and with a shared sense of purpose, we have made a small difference, eased suffering and created hope.